From the moment you arrive in Nepal, you will know that you are in the big time. The legendary peaks that loom above—Everest, Lhotse, Kangchenjunga, Annapurna, Manaslu—carry a gravity and sense of history unmatched. Nepal is the true birthplace of adventure travel, where less than rational people come from all over the world to prove something to themselves or to the world’s biggest mountains. 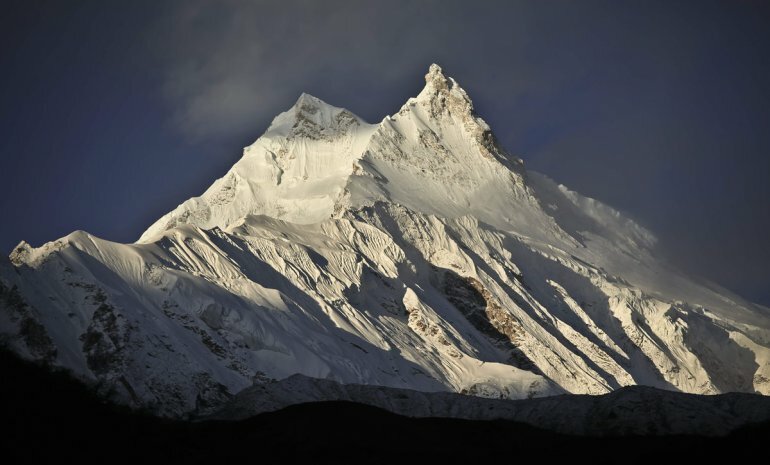 Nepal is unimaginable from a geographic standpoint: 125 miles top to bottom, elevation ranging from sea level to the highest point on earth at 29,029 feet, and 240 peaks towering over 20,000 feet. The frying pan flat Indio-Gangetic plains are hot and dusty, lower elevations are tropical, and the great Himalayas are as alpine as alpine gets. Kathmandu is chaotic, yes, but also highly endearing. The city is not structured for the automobile yet they race in abundance through the narrow streets with little concern. 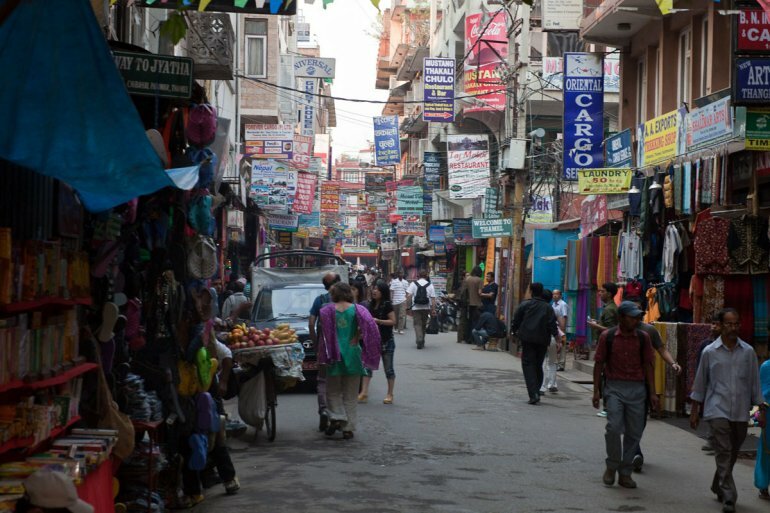 Most visitors are based in Thamel, the main tourist district home to myriad shops and a number of lively restaurants and bars. The area is buzzing with energy from fresh, clean-shaven folks preparing for their treks as well as recent returnees (it’s not difficult to figure out who belongs in which camp). Grab a beer at a classic mountaineering establishment like Rum Doodle and soak up the atmosphere unique to the urban base camp for the world’s biggest mountains. In Kathmandu you likely will become acquainted with a guide and porters for your trek. 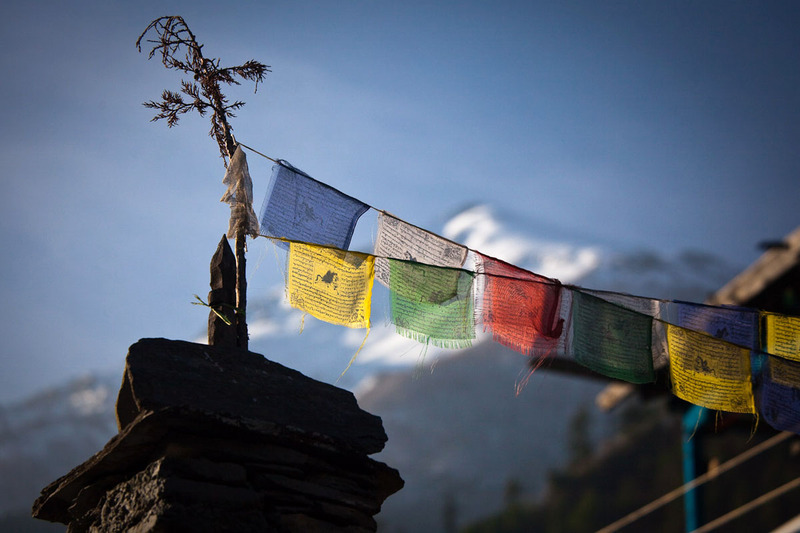 Some itineraries can be completed solo, such as the Annapurna Circuit trek, but guides are required in many areas and porters are necessary for longer and more remote trips. Local expertise will enrich the experience, help with the language barrier and keep you safe, and you will in turn be supporting the local economy. For better or worse, the group functions as a family and you will leave with fond memories and Nepalese friends. At press time there is exactly one road out of Kathmandu to the central and western Himalayas (flights to the infamous Lukla airport access the Everest Region). You and your fellow tourists won’t be alone either seeing that the road is the industrial and commercial lifeline for the entire side of the country. But as you sweat in a hot jeep or bus cursing the traffic and potholes, remember that not long ago there were no roads and all expeditions set out from Kathmandu proper. Sir Edmund Hillary and his massive group hiked over 200 treacherous miles just to reach Everest Base Camp . Upon leaving Kathmandu the Himalaya begin to unfold before your eyes. The foothills, a formidable mountain range in their own right anywhere else in the world, resemble giant waves of earth increasing in size as you head north. You will pass up and down through numerous valleys until the end of the road…quite literally. It’s a strange feeling getting dropped off in unfamiliar surroundings with four rice bags full of gear and half the village stopping by to investigate your arrival. And to make things more interesting, it’s sweltering and from ground level nothing resembles the big mountains from all the pictures. The first few days on the trail very well may be the most difficult. They are long and hot, and without netting significant elevation you will cover a lot of ground by ascending and descending the remaining foothills. Do your best to overcome, or at least suppress, fear of Nepal’s infamous suspension bridges because you will need to cross a couple dozen throughout the trek. It won’t help that the rivers at lower elevations are raging with snowmelt that has come down 20,000 feet in a very short distance. Be rational, everything should be fine. Every couple of hours or so, less frequently at higher elevations, you will pass through a village home to a handful of families that have been settled there for generations. In fact, the trail you are walking on is not a tourist route but the primary method of transportation for local residents. This becomes evident as you share the trail with herders and their yaks carrying wood and other supplies up and down the mountains (make sure to stay on the mountain side of the trail so you don’t end up in the valley). Roughly a week into the journey you will realize that the jungle and foothills are past and the big mountains are drawing close. Instead of traversing over valleys the climb turns steadily uphill and your daily schedule becomes dictated by gains in elevation. This is a special part of the trek as an air of excitement continues to build on the approach to the world’s highest peaks. Viewing mountains that soar over 20,000 feet into the sky is not automatic; cloud cover is common even during good weather. Far and away, the best time is just before daybreak when the sun has yet to reach the rest of the earth. Bring a watch that has an alarm function (and an altimeter) and set it for at least thirty minutes prior to sunrise for a breathtaking scene. The sky at these elevations is the deepest of blues almost reaching black, the snow and ice glow while reflecting any available light from the moon and rising sun, and the first rays find the highest peaks before inching slowly downward. You will most likely need to cross at least one major mountain pass during your trek (or make it to base camp). By this point you will be in top condition, so just remember to drink plenty of water and abide by proper acclimatization. Crossing the pass will be an arduous day; the sun is strong, the air is cold with gusting winds, and it seems considerably more difficult to do anything at 17,000 feet. You will hear the cracking of glaciers and may witness an avalanche rumbling down a rock face high above—high in the Himalayas we are all on borrowed time. Camping while exposed at these altitudes is best avoided, so after the pass you will have to push downward further than you might prefer. This day is the leading candidate for a pounding headache, although your body wouldn’t be doing its job without questioning the antics. When you arrive at camp, pat yourself on the back and sprawl out for a richly deserved night’s rest. During the following days you will make your way downward through familiar terrain back toward the jungles, raging rivers and heat of the lowlands. It’s sad to see the Himalayas shrinking in the rear view mirror, so to speak, and they begin to feel unreachable again. But you will rightfully feel proud and know beyond any doubt that you are a fuller person for having visited the giants and come to know them, even if only for a short while. You will also be exhausted and ready for civilization, a hot shower, and a cold beer. If you’re crazy like I am, this is when you start planning your next trip into the Himalayas.